The American Treasure Tour is a unique place - it is a museum, but it's unlike any other museum you have ever experienced. There's no plexiglass between you and the objects on display, and no piercing whistle will go off if you get too close to any of our treasures. We provide a tram ride to take you through our wonderful collection of collections. Some of the visitors who come to see the Tour tell us we remind them of other places around the country. 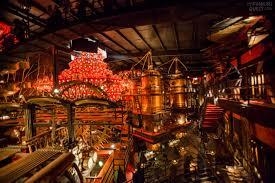 One of those places is all the way out in Wisconsin, called The House on the Rock.